Italian hot chocolate, if you ask me, should officially be declared the Food of Gods. 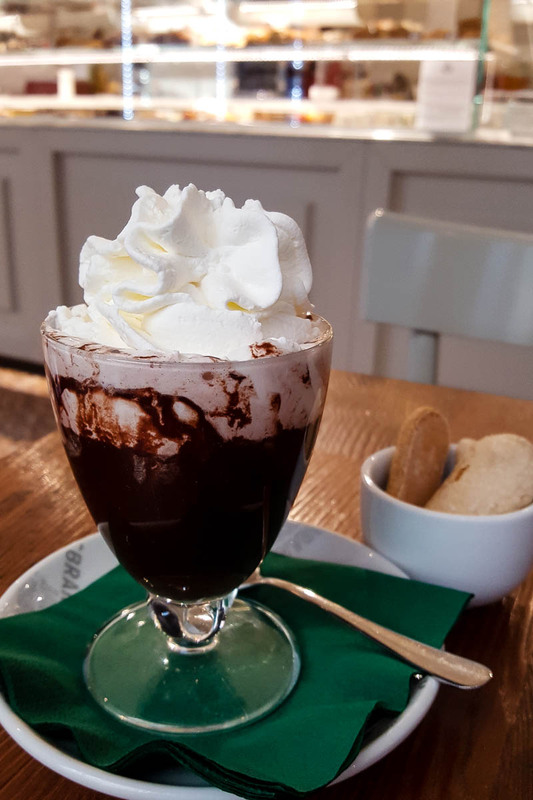 For, if you have spent any time in Northern Italy during the cold months, you would have soon come to realise that the best thing to ward off the freezing cold and to make your heart sing a happy little song is a cup of proper Italian hot chocolate. Thick and luxurious, gooey and just a touch bitter. Plus, if you pile up the whipped cream on top, then it becomes smooth and velvety on the tongue. A real crossover of physical delight and emotional pleasure. Yes, you will be spoiled for life. As, once you have had the real thing, you can never go back to whatever they sell as hot chocolate in corporate places around the world. Those huge cups filled with a liquid that is more water than cocoa. That cream that is squirted out of a spray can and disintegrates within a minute max and those cutesy white and pink mini marshmallows they put on top and the sweetness of which is designed to mask the blandness of it all. No, if you are to have a hot chocolate, please, do yourself a favour and have an Italian one. Preferably, in Italy. 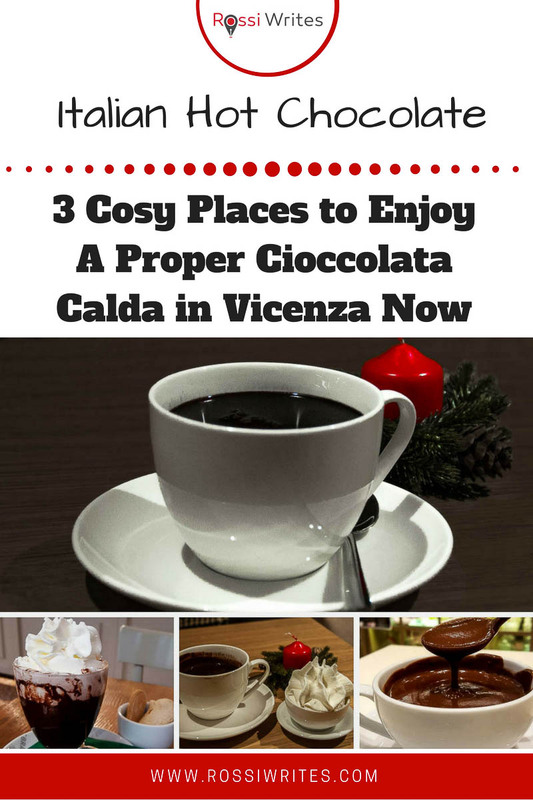 And, ideally, in Vicenza, where I personally tried and tested several cioccolate calde in the local cafes in order to sieve through the three very best ones especially for you. My criteria were simple but exacting. I was looking for the best drinking chocolate in the cosiest surroundings. A place you keep returning to either with friends or by yourself to have a little moment of chocolate-y pleasure while the weather is cold and biting outside. I wanted a thick, satisfying hot drink made in the best Italian style. Something to really write home about or, better, blog about. Here I have to say that it is all based on my personal preferences and, also, this is not paid-for advertisement. I was just an ordinary customer paying for my hot chocolates in full and have not even mentioned to the people running the respective cafes that I have a blog. It’s all unbiased and I have been truthful to myself. So, here are the results! Read on! Who knew that I would discover the perfect for me Italian hot chocolate in this artisan gelateria which opened five months ago in Vicenza. Apart from the amazing gelatos and semifreddos they make on the premises and sell, the two sisters who run this place also make the most soul-satisfying cioccolata calda. It’s rich, very flavoursome and so dark in colour that it seems almost black. Yet, it is very shiny like a slab of high quality, well tempered chocolate. Moreish and then some! The hot chocolate at Capo di Latte is made without milk. Apparently, this makes it piu digeribile or ‘easier to digest’ in English, as they told me there. Just imagine then the amount of cocoa that goes into their hot chocolate to make it this thick and flavoursome! The best bit is that there are several types of hot chocolate served there. The classic costs €3.50 and for €5.00 you can order one of three special varieties of cioccolata calda: with berries, with caramel or with coffee. A portion of whipped cream costs €0.50 and it is served generously piled in a small saucer for you to add as much as you want to your hot drink. You can have your hot chocolate on site or to go. All in all a lovely experience! Corso Antonio Fogazzaro, 56. Open every day but Monday from 10 am to 8 pm and with late closing times (11.30 pm) on Friday and Saturday. A beautifully presented artisan hot chocolate in a tall glass topped with lashings of whipped cream and served with a mini bowl of bite-size ladyfingers to dip in. Very pleasing to the eye and to the palate. Not to mention – perfect to take a quick photo for social likes and shares. You can make your experience even more lavish, by choosing a couple of small dolci from the gorgeous display with handmade sweets. 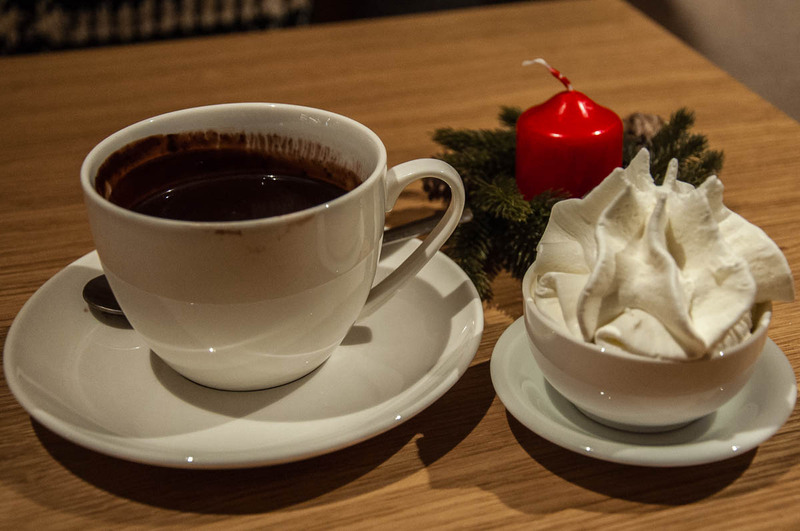 Artisan hot chocolate with whipped cream and included mini bowl of ladyfingers – €3.20. Contra Porta Padova, 106. Open every day from 6:15 am to 8 pm except on Mondays when it closes at 1.00 pm. A very nice place to sit and sip your hot chocolate surrounded by locals and listening to their banter while pretending you don’t understand a word. 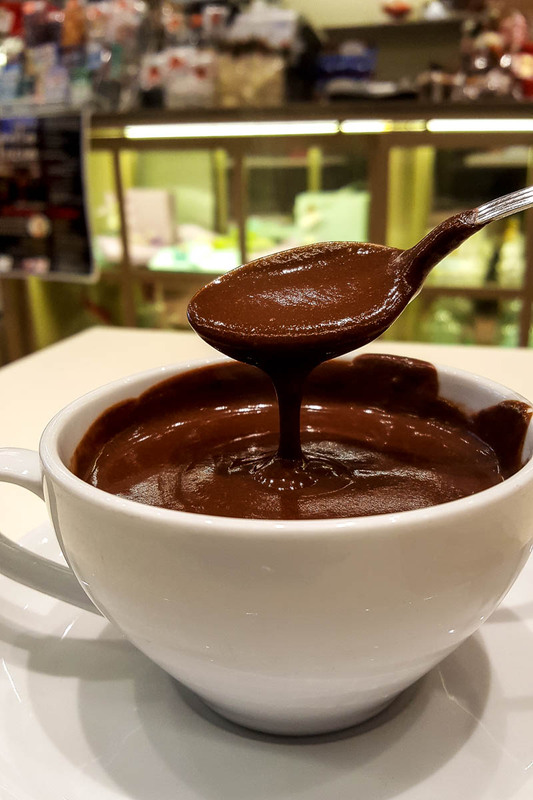 They make their cioccolata calda by tipping two overloaded spoons of unsweetened cocoa in a mug with fresh milk and then mixing the thick substance as they warm it up. The result is a liquid so dense a spoon can almost stand upright in it. You can add some sugar and ask for whipped cream, but my humble advice is don’t do it. Better enjoy your cupful as it is, unadulterated and gooey, spoonful by spoonful. You will feel the hot chocolate spreading its warmth all through your body long after you have left the cafe. Service can be a bit stand-offish at times and much chattier and livelier with the locals who go there every morning to have their coffees and brioches while discussing the latest news. It is always courteous though, so don’t be put off. A cup of hot chocolate is €3.00. Via IV Novembre, 56. Open every day from 6.30 am to 1.00 pm. For more interesting information like this, please, follow me on Facebook and subscribe to my weekly strictly no-spam newsletter.